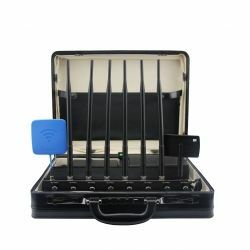 CPJ-UAV6 Quadcopter Drone Jammer. Quadcopters become very popular in 2015, and this is one of our the latest desktop models with 6 bands to jamm there remote controls ,GPS position designed to block all wireless Drone aircrafts in the vicinity of CPJ-UAV6 product will be unable to receive signals ,cant controlled. The jamming Radius (50-80) meters@-75dBm still dependson the strength signal in given area. . the CPJ-UAV6 Series that fits the appropriate commercial or institutional application. Jamming Range Radius 50 meters (-75dBm@Omnidirectional antennas).